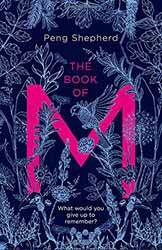 The Book of M (2018. 485 pages) is a post-apocalyptic novel by first time writer, Peng Shepard. The story is told from several POV characters, with each of the chapters headed with the name of a single character. The first person we encounter is Orlando Zhang who is hiding from the end of the world in a deserted hotel, where he and his wife, Max, were attending a wedding when "the forgetting" arrived. Max has lost her shadow, so Ory is hesitant to go out foraging, but go he must. When he returns he discovers that Max has left, not wanting him to witness her decline. Here the narrative splits with Max heading south, while Ory, thinking that she might try and make it back to their apartment, heads towards Washington. Concurrently with their story there are two other stories unfolding. We meet Naz Ahmadi who has moved to America from Tehran. A talented archer, she is training for the Olympics when "the forgetting" stops flights to the USA. Cut-off from home and everyone she knows, she does her best to survive alone. The One Who Gathers is the last main narrative thread and I’ll leave that one a mystery, so as not to spoil the book. As the characters travel across a desolate landscape the reader is shown the many ways that both the shadowed and the shadowless have coped with events. Few people they meet are friendly with both sides attacking each other and anyone else they meet. The shadowed because they mistakenly think that the forgetting is like a communicable disease and the shadowless because they often only have fear and anger left. One of the real strengths of the book is Shepard’s ability to construct convincing characters with distinct and individual voices. The narrative allows the audiences access to the characters inner thoughts and fears. In flashbacks the book unfurls the sudden and swift disintegration of society across the world and this switching between past and present slowly reveals how it happened, if not why. Without giving it away the ending of the book takes a known genre and twists it into something more hopeful and magical. I guarantee you will never see the end coming or the one real horrific outcome of regaining a shadow. It was a deeply satisfying read and I look forward to her next book.